I’ve been on a fresh pasta kick lately. Not making it, no, but buying it from a local company. :) But local it was, and thus a fitting candidate for this week’s Dark Days winter eating local challenge. (In my defense, I did make crackers last weekend with a pasta machine in my flatbread class.) Fresh pasta is toothsome and has a pleasant bite if it has been made with premium ingredients. I can really taste the difference, especially in lasagna. I’ve had a bumper crop of arugula this winter, so much that I treated it like spinach and made a wonderfully cheesy arugula lasagna last week. It didn’t qualify as local meal because I used non-local cheese and tomato sauce, being out of my own, but it was delicious. 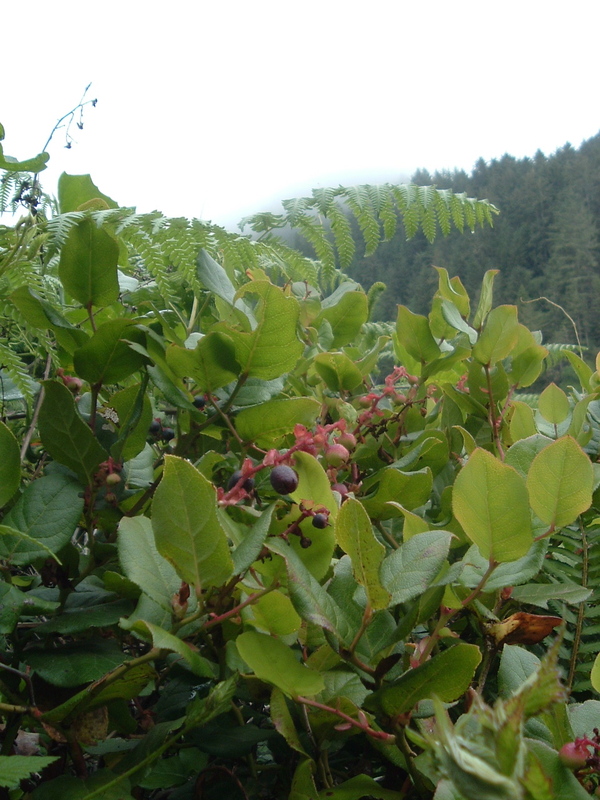 We’ve been eating heavy-on-the-arugula salads, too. I even mixed some in to my salad served to the bread baking class participants this weekend. We’re all so desperate for green at this point in the winter, the salad was more of a hit than I expected. 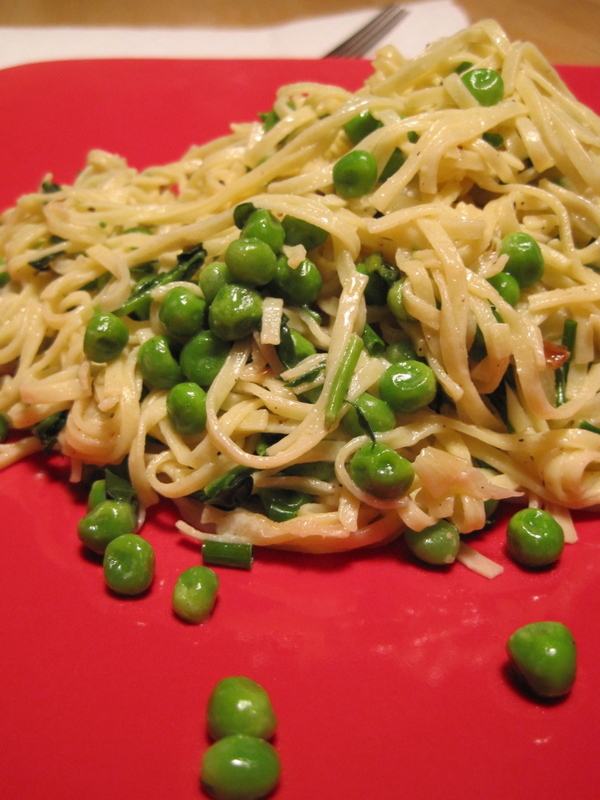 For the Dark Days challenge, I did manage to rustle up a delicious creamy spaghettini with arugula, onions sauteed only ’til pale gold, and local frozen peas from Stahlbush Island Farms, our Willamette Valley processing facility. My idea was based on the French spring vegetable dish of creamed new petits pois with shreds of lettuce. The sauce contained some frozen homemade chicken stock and local butter and cream, and was quite mild. Loads of salt and pepper and the first chives of my garden finished it off. Consider the pea. I’m kind of smitten. Supplies are gettin’ low down at the ol’ homestead. Which is a shame, ‘cuz I managed to squeeze in a few nights of cooking this week. Next week, I’m hoping I can cook AND blog. There’s a light at the end of my tunnel of lo…work. So, cursorily: this week’s Dark Days winter local eating challenge used up some (of the many) dried foods I put up last summer. Speaking of love, we had freshly steamed dungeness crabs for Valentine’s Day, then used up the leftover crab meat to make a gorgeous, silky, spicy crab soup. The soup lacked my customary Old Bay (I had used up the very last bit) and home-canned tomatoes (I’m plum out). Instead, I fortified the dried vegetable-and-crab-leg-shell stock base with a couple of cups of half and half. A jar of homemade pepper salsa and just two tiny slices of dried habanero gave the soup plenty of kick. 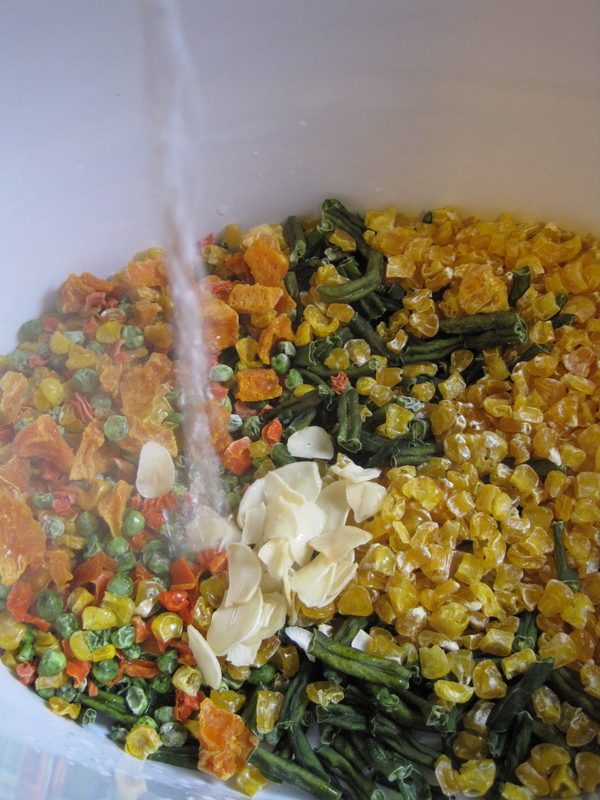 As for the other dried vegetables, I used about two cups of mixed dried corn, peas, carrots, green beans, butternut squash, onions, red peppers, celery and garlic to six cups of boiling water. The vegetables were a combination of my own garden produce and frozen vegetables from Stahlbush Island Farms, our local organic processing plant. At the end of summer, when vegetables are overflowing the trucks, even the organic frozen vegetable outfits will put their products on sale, so I snapped them up and had a drying fiesta. And thank goodness, because they come in handy. I let the vegetables rehydrate for a couple of hours, then added the salsa and habanero. 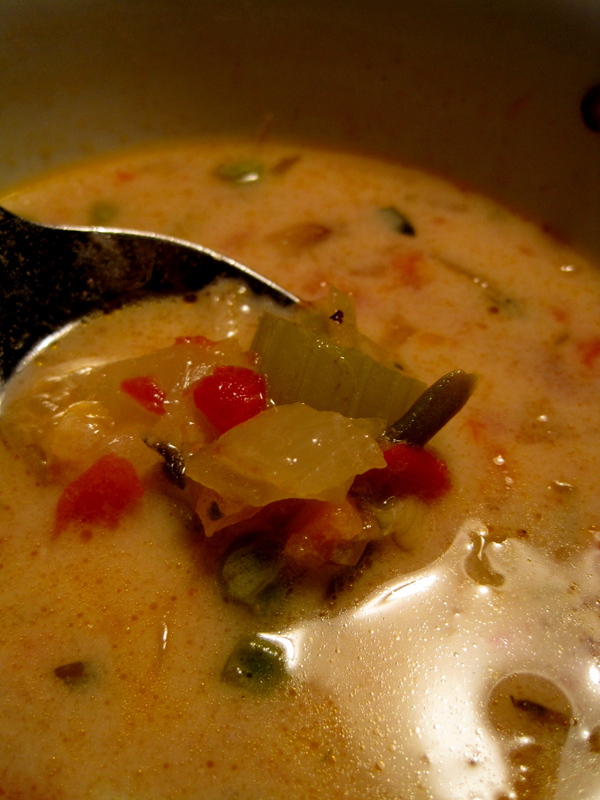 While the vegetables were plumping up, I sauteed a small yellow onion and a few stalks of celery. I had my doubts about the dried celery, since I hadn’t dried it properly. I suspected it would be tough, and I was right. Next year, celery chips? Just before serving, I removed the crab shells flavoring the broth, added the crab and Noris cream, and was good to go. The celery-crab combination is one of those magic flavor connections. I highly recommend it. By they way, if you’re craving fresh local vegetables, there is already a nice selection at the Winter Farmers Market in the Mazzi’s parking lot on Saturday mornings. You can pick up greens, leeks, onions, potatoes, squash, salad materials, and other good stuff, including dried fruit, eggs, and olive oil. I also scored a wonderful gallon of winter apple cider from Riverbend Farm and some excellent pork chops from the Biancalana family. Yum. For the first time in 10 years, I had authentic paczki for paczki day! Holy Donuts made a batch just for people like me, reasonable people who celebrate the day before Lent in Polish-American style. Hooo yah! 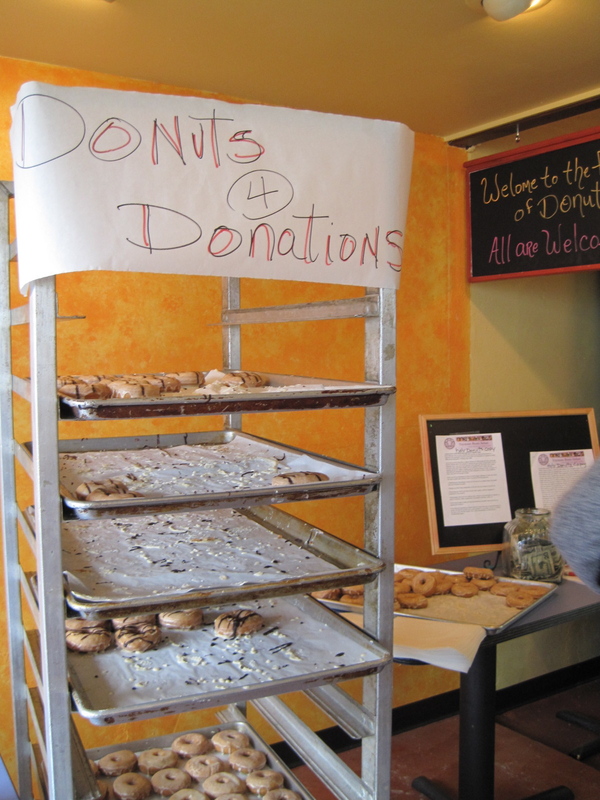 I stopped by the shop twice (slightly accidentally) and watched all the good vibes flowing for their “Donuts 4 Donations” Haiti fundraiser, raising money for a local friend’s group that sent medics and midwives to help the relief effort. Hope you celebrated your Fat Tuesday in a similarly pleasant way. 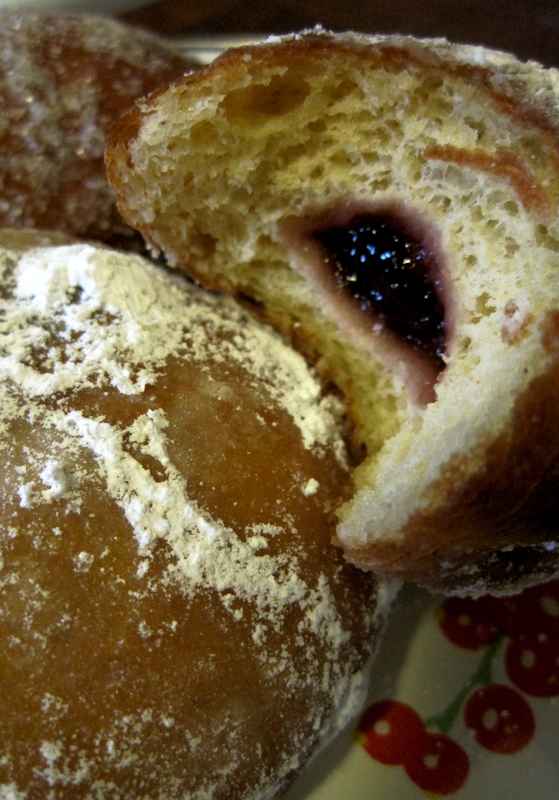 I don’t observe Lent, but I’m feeling that I might need to do penance for the rich, eggy, oozing raspberry jam fried doughs of deliciousness that sacrificed themselves to me today. On the other hand, Karen, when will you be making more? Retrogrouch and I dined on the dish I’ve been waiting all year to make, choucroute garnie, for this week’s Dark Days winter eating local challenge. I’ve been saving my homemade sauerkraut and stocking up on sausages just for this day. Choucroute garnie (garnished sauerkraut), an Alsatian specialty of baked pork and sausages served over a mound of Riesling-braised sauerkraut, is enjoyed in France on grey, rainy days just like the ones we’ve been having in Eugene. With our local dry Riesling both in the pot and in the glass, what could be nicer? This recipe is best, of course, if you make your own choucroute. This particular batch was made with cabbage from Cinco Estrellas Farm in Junction City. We used andouille sausage from Sweet Briar Farm and peppered pancetta was from Biancalana pork growers out of Springfield. The smoked pork loin chop, hrmm, were from somewhere I don’t recall — I think Long’s — and I’m willing to bet they’re local. One of the nice things about this dish is the great flexibility in the meats served as the garnish. You simply need a mix of smoked and mild pork. I’ve made it with ham, a world of sausages, and even a small hunk of pork shoulder. I most often use kielbasa because I’m Polish. Maybe we should call it à la Polonaise? Yes, maybe we should. We ate the choucroute with some baked russet potatoes from Ladybug and mustard that was as French as the Marseillaise. Preheat oven to 350. Heat duck fat in a large pot. Add the onion, and cook until translucent and slightly golden. Add the sauerkraut, juniper berries, garlic, wine, and spices. You might also add some freshly ground pepper. Cover and bring to a simmer. Add the pancetta and smoked chops or ham. Cover and bake in oven for about an hour to meld the flavors. While the sauerkraut is cooking, boil water for potatoes and to heat up the already cooked mild sausage. Peel potatoes, leaving them whole. Boil until just fork-tender. Remove the potatoes and heat the sausage in the cooking water, about 5 minutes, just before serving. 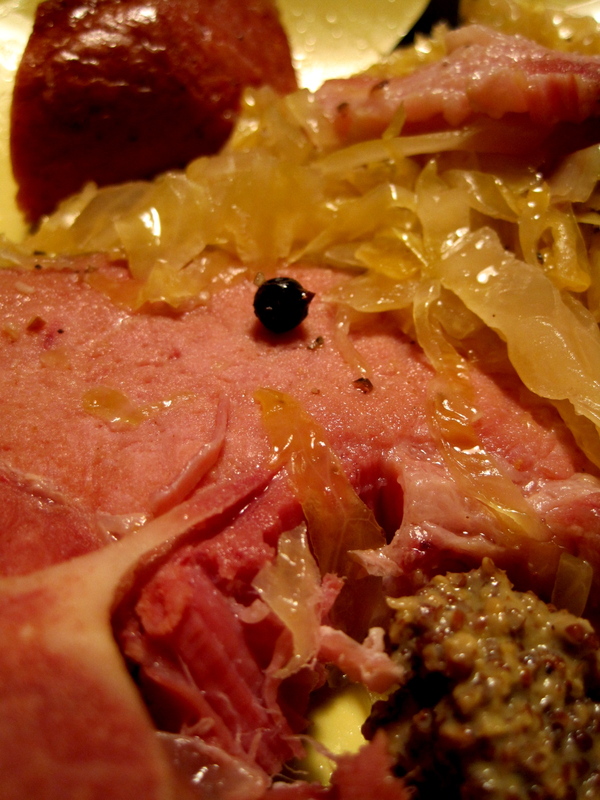 To serve the choucroute garnie, drain the sauerkraut, if necessary, and mound it in the center of a large serving platter. 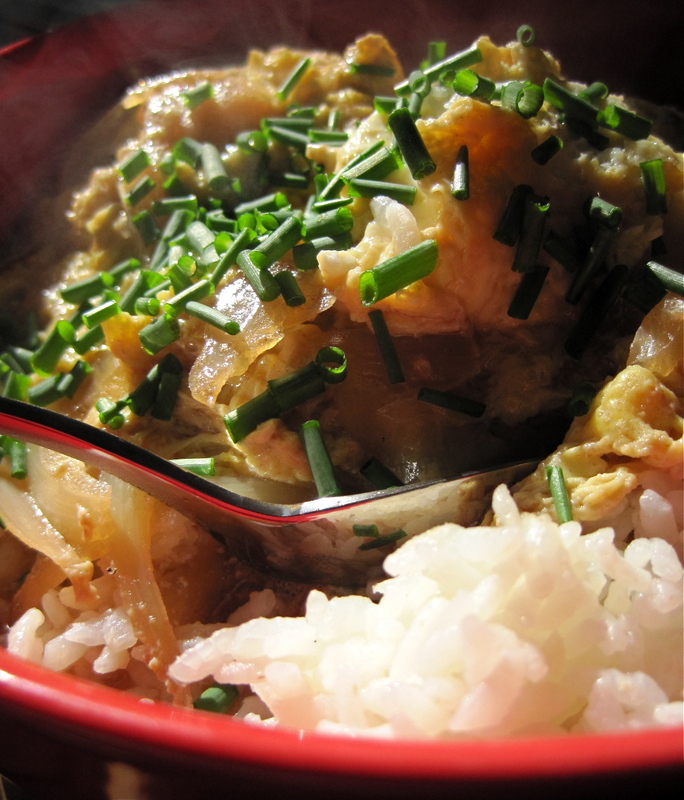 Arrange meats and boiled potatoes around the sauerkraut. Serve with a variety of mustards, including Dijon and whole-grain. I wake up and do some reading. Decide that I must finish grading the rest of my literature papers, having had no opportunity to do so in the previous two fully booked weekends. The natives are getting restless. So am I. But the distractions at home may overwhelm me today, so I decide to work either at a café downtown or over lunch. I eat, Corey and I talk. This is not the paper-grading plan I’d envisioned, but I’m happy to chat about developments in the Eugene dining scene, and am thrilled to eat two well-prepared Asian dishes with an earnest, pleasant young chef while doing so. I decide to repair to Holy Donuts on Willamette and 15th to tackle the grading. Plus, I have to talk to owner Karen about her upcoming donuts-for-donations Haiti fundraiser on Tuesday, because she’s making PACZKI and you know how I feel about that. Karen’s not there, but sister Kelly is irresistible, and I chat with her for a bit about donuts and life while I coffee-and-donut myself with the weekly special, the Banana Fana. With a vegan “cream” filling, the banana cream is surprisingly light and tasty, and I am unreasonably pleased by the dried banana chip glued to the top of the donut with a mound of chocolate frosting. I comment on the first page of one paper. The waffle brothers from Off the Waffle come in. It’s the first time I’ve seen them in a while, so I catch up on a trip one of the owners recently took and the workings of the new restaurant. I love those guys. I comment on the first paragraph of the second page. J.P. of Eugene’s newest panini & soup delivery service Devour arrives, delivering sandwiches in his stylin’ VW bus. I haven’t met him, so we chat and he tells me about his new route. 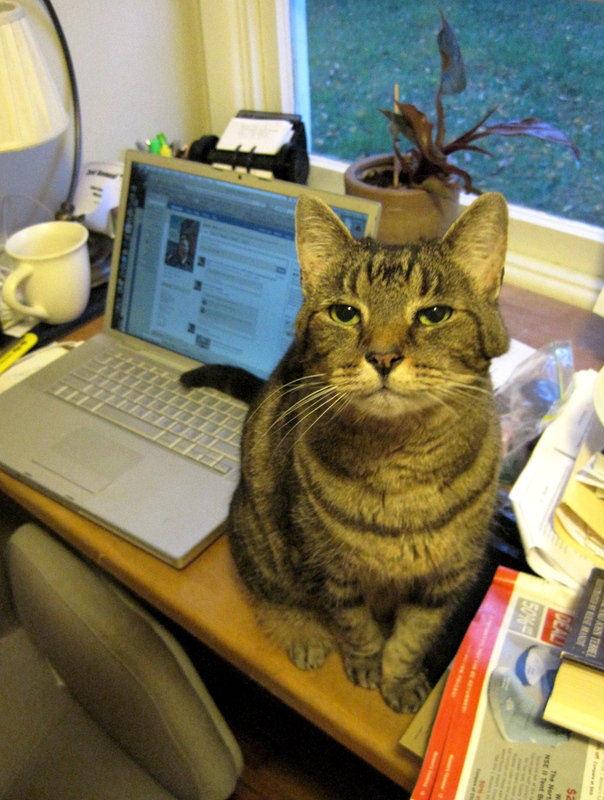 As soon as I have a minute, yes, as soon as I finish these papers, I will head over to Oakshire for one of his sausage evenings. Oh yes I will yes. I escape to a nearby bar to drink away my sorrows. OK, not really, but I do decide to stop in at The Rabbit to have a grapefruit consommé cocktail. It’s happy hour, after all, and I love their cocktails. I tell bartender Rico that I’m trying to hide from the world to do my grading, and bunker down in a corner at the bar. I ignore friendly man trying to talk to me about my “thesis” and a parade of interesting people coming in and talking shop with the Rico and owner. I am seduced by a discussion and taste test of a new (slightly disappointing) Fee Brothers bitters flavor, Aztec Chocolate, and french fries. It’s happy hour, after all. And The Rabbit’s french fries are the best — and only 2 bucks at happy hour. Who am I to pass up a deal like that? Market of Choice is now carrying chocolate and vanilla It’s Its, the San Francisco treat. If you’ve never had this deluxe chocolate-dipped, ice-cream-filled, oatmeal cookie sandwich, you’re missing out. Where was I? Oh right. Lots of work to do. A corporate assessment team would declare my inefficiency, my mobility, my distractions a disaster. Big City Dwellers would not envy the inability to remain anonymous in public places, to actually do work, unmolested by one’s community. But I feel richer for the day I had. Moments like these make me very happy I live in Eugene.